What else can ASEAN do to deescalate the South China Sea conflict? The new Chinese hegemony in Asia Pacific poses both opportunities and risks for member states of ASEAN. China’s Belt and Road initiative promises new economic frontiers and some South East Asian countries are only too willing to concede to the territorial ambitions of China in the South China Seas to pursue economic growth. This week, the foreign ministers of ASEAN signed a draft agreement on the code of conduct in South China Sea. Dubbed as a milestone agreement, it offers a quick resolution to the diplomatic tensions and is seen as a ramp to deescalate the crises in the region. The issue came to a boil when China dissed International Arbitration Court’s (IAC) ruling to install air and naval bases together with other defence infrastructure in a newly reclaimed land off the Spradley’s Islands. Vietnam, Philippines, Malaysia, Indonesia, Brunei and Taiwan are claimant states as China’s territorial claims overlap the exclusive economic zones of these countries. China’s rise in this region is unmatched – no member state in ASEAN can stand up to the economic and military might of The Middle Kingdom. ASEAN countries do significant trade with China and the Chinese have become the largest investor group often causing a dilemma of whether ASEAN should pursue economic interest or protect its territorial interests in the resource rich South China Sea. In a closed-door meeting with Harry Roque, spokesperson for President Duterte of the Philippines, said somewhat in despair, “What else can we do?” Underscoring the frustration of their inability to enforce the UN Laws of the Seas (UNCLOS) or the IAC ruling on China. Analysts are of the view that UNCLOS is ineffective against large powerful states like Russia and China. Yet, smaller states are expected to comply with international rule of law. While China has pushed its territorial boundaries unilaterally, the United States of America, on the other hand, has become more insular in the last two years. The new Trump administration has shut down the TPP, a trade pact in the Asia Pacific region, and has been embroiled in a war of tariffs with China. US strategic retreat and neo-isolationism started with President Obama and the Economist described it as a “visceral recoil at confrontation and a distaste for strategic gamble.” And Obama was famously quoted for not wanting to go to war over a bunch of rocks in the South China Sea. The absence of US in the region has caused security concerns for ASEAN. 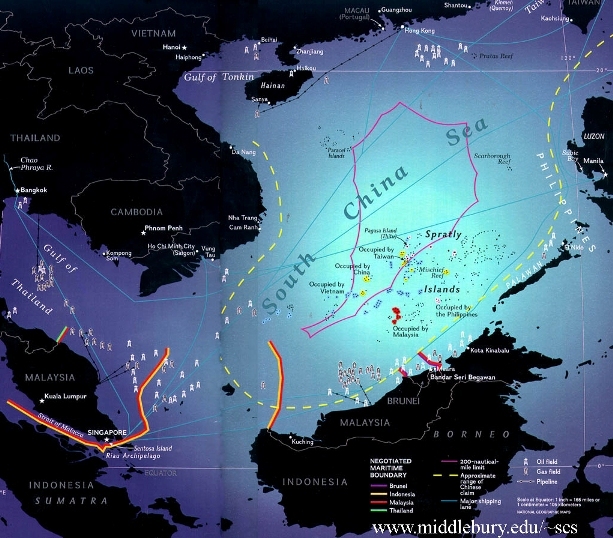 China’s territorial expansion of the nine-dashed lines in SCS restricts freedom of navigation and it affects maritime trade and fishery by the local communities. Vietnamese fishing vessels have been targeted by Chinese Navy in the last two years. This is despite China’s assurance that there will be absolute freedom of navigation in the South China Sea. Hence, when the foreign ministers of ASEAN signed a draft agreement on the code of conduct, the ASEAN community was quick to hail it as a “milestone” achievement. 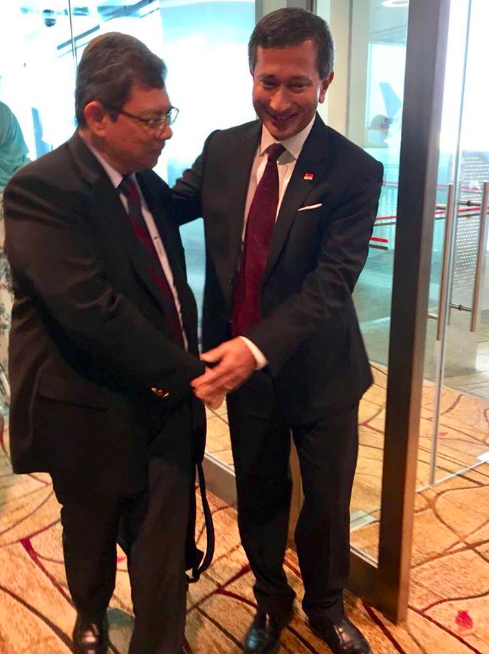 But one former diplomat of Singapore, Bilahari Kausikan, in a rather prudish and undiplomatic manner posted on Facebook that there was no reason to hold our breath in the new development and that the final draft may take years to conclude. He is right about the protracted nature of how international treaties are signed and concluded. Yes, the signing of this draft agreement has done little to reverse or mitigate the risks in SCS. And China’s non-adherence to the international rule-based system is still a cause for concern. Having exhausted the international legal system, there are limited diplomatic options left and therefore the signing of the agreement is indeed a milestone achievement for maintaining peace and order in this region. US’s on-off and then on-again strategic relationship with ASEAN is certainly baffling but that’s just scratching the surface. What is interesting is that the military leaders and think tank on both sides of the Pacific Ocean have maintained ties and have advanced the defence cooperation in the region. Lieutenant General Cardozo M. Luna, Undersecretary of National Defense of the Philippines has reaffirmed the defence cooperation between the Philippines and the USA and said that the USA continues to be a strategic defence partner in the Pacific. It is certainly reassuring that the US diplomatic corps are committed to this region. The US has also expanded their area of influence to include the Indo-Pacific as opposed to Asia-Pacific. Indian naval vessels have been present in the West Philippine Sea. The South China Sea, often referred as the West Philippine Sea by the Filipina military and diplomats seems like an attempt to reclaim their seas but that does nothing to thwart the threats of China in the region. Prime Minister Lee Hsien Loong went too far ahead of the rest of ASEAN in 2016 to get China to adhere to the IAC ruling but only to discover that Duterte was more amenable to a non confrontational approach with China. In retaliation, China confiscated our military vehicles in Hong Kong, which caused much disquiet here. The lesson here, as some would say, is to let the claimant nations fight for their own territorial rights. Besides, one Malaysian bureaucrat said that we are too small to create an impact in this region. Given that there are limited pathways for de-escalation, a code of conduct is certainly the best option going forward while concurrently pursuing new economic frontiers with Japan, Australia, India and the United States of America. Kumaran Pillai is the publisher of this publication and a Jefferson Fellow of the East-West Centre, USA.